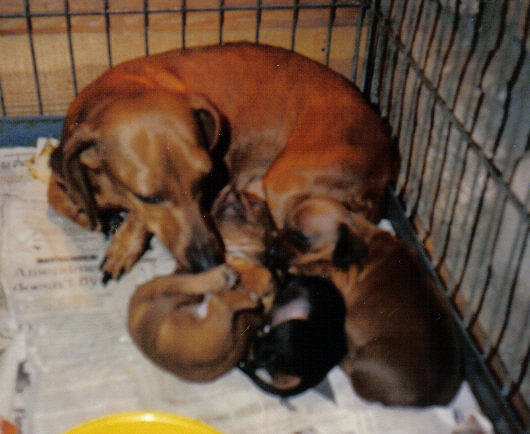 We have been Dachshund only breeder for about 28 years. We breed what we love. We have Reds, Black & Tans, Chocolates, Piebalds, Dapples and Isabelles and hope to have Creams in the near future. We only sell to individuals and guarantee each puppy's health. All our Dachshunds are AKC registered. We ship (weather permitting) usually by Delta. Shipping is extra. Our prices are very reasonable and include puppy, health guarantee, 4 generation pedigree, shot and deworming record. We do keep a waiting list for our puppies. You can contact us with what you are interested in and we will let you know when one becomes available. We will not take deposits on puppies until they are 4 weeks old. This helps to insure the health of the puppy. Deposit is $100. We are pleased to announce that in November, 2018 we were found to be in complete compliance with all rules and regulations in an audit by the American Kennel Club. 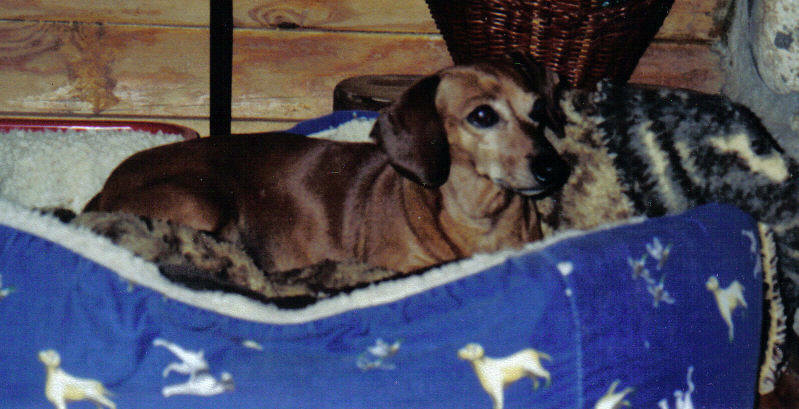 "The reason a Dachshund has so many friends, he wags his tail instead of his tongue"
On May 18, we lost Sadie, our 17 1/2 year old dachshund. She was so special to us, and she was the first female we ever bred. Many of you who have visited our kennel will remember her, as she always had to greet everyone. She will be greatly missed. Sadie as a new mom.